Well, that wasn’t too bad, was it? Happy endings all around, Kali and the Darach aside. 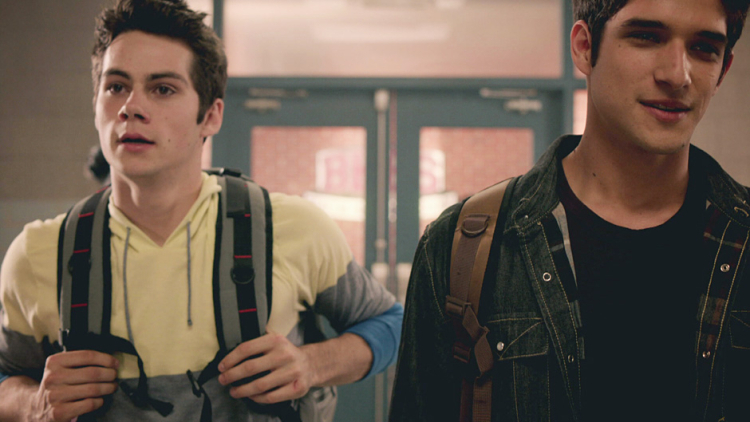 Of course, God only knows what’s coming to town after the kids put the “beacon” back in “Beacon Hills.” But, for now, everyone’s safe, sound, and moderately okay–even the scarring was kept to a minimal, with the exception being Scott, Stiles, and Allison and their newly-darkened hearts. Those should provide Teen Wolf with plenty of deep and personal character drama in the future, but let’s not get ahead of ourselves…we’ve still got “Lunar Ellipse(/Eclipse? )” to discuss! Post-sacrificial deaths, Scott, Stiles, and Allison woke in a bright and empty Dark Knight-esque room decorated solely with the Nemeton and a few hundred fluorescent lights. Scott reached the roots first and pressed his hand to them; immediately, he was taken to that fateful night during the pilot when Peter bit him. The roots took Stiles there, too, and Allison wound up nearby, where she and her mother nearly ran over Scott, then stopped and found his inhaler in the woods. No, this wasn’t an afterlife trip through the past; the Nemeton’s location was right beside where the trio’s supernatural adventures began. After their respective mental journeys, the trio woke up for real in Deaton’s veterinarian office, and Deaton quickly informed them they’d been out for sixteen hours, leaving the lunar eclipse only four hours away. Whoops (but also convenient!). Before the group could formulate a plan, Ethan the Nice Twin burst into the vet’s office to fetch Lydia for help stopping his brother and Kali, who were on their way to kill Derek. Though Cora’s healthy and healed, Derek’s a weakened Beta shell of his former Alpha self and unable to fight. 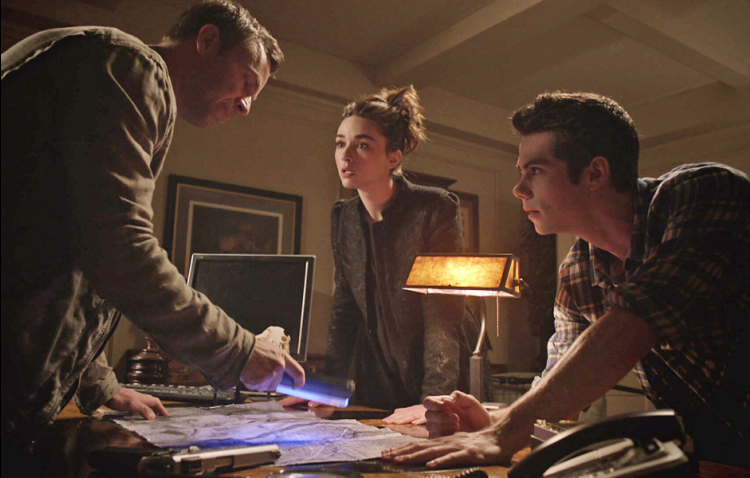 Peter made the Hale siblings run and disappeared himself, just as Kali and Aiden confronted Lydia and Ethan. But, before anyone could attack, Jennifer burst through the ceiling (she and Derek have that overly-dramatic entrance thing in common), slaughtered Kali with shards of glass, and broke the neck of the conjoined twins (don’t worry, they’ll later be taken to Deaton by Lydia and Cora and saved). Then, she rounded on Lydia and urged her to scream, knowing Derek and Cora would hear and come running (which they promptly did). 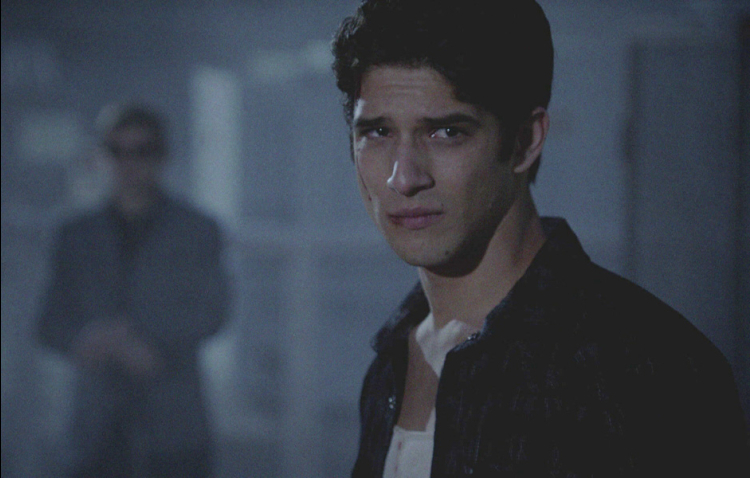 At Allison’s, where she, Scott and Isaac were gathering weapons, Scott ran into his father waiting for them. With no leads on the murders other than the kids, Agent McCall hoped to grill Scott and co. for information. Allison had other, better plans that involved a quick defense of her father’s need for the weapons followed by the dropping of a smoke grenade. At the same time, Stiles found himself in the middle of a Darach-influenced storm and crashed his jeep into a tree. As Scott rejoined the Deucalion, Allison and Isaac went off in search of Stiles, until Isaac heard Mr. Argent’s sonic emitter, and the pair found the root cellar instead. With the Deucalion at his side, Scott came up with a nifty use for product placement and lured Jennifer to the slaughter warehouse where the Deucalion originally lost his pack. She arrived, but not alone: Derek, having fallen for her revenge pleas, joined her to take down the Deucalion and save the guardians. Of course, the demon wolf transformed into his namesake and proceeded to take the pair down, until that pesky lunar eclipse hit. As the Deucalion lay defenseless on the ground, Derek urged Jennifer to heal his eyes (knowing this would weaken her) so he could see her true face. Jennifer, all too happy to oblige, healed the Deucalion’s blindness and reverted to her hideous, evil Druid face. Luckily for the wolves and unfortunately for Jennifer, she weakened herself long enough for the eclipse to end. Trying to protect herself long enough to complete the sacrifice (the guardians plus Allison and Isaac were about to be crushed in the cellar, thanks to the Darach’s magic storm), Jennifer dropped a circle of mountain ash. Scott didn’t care; he shoved his way through the circle–becoming a red-eyed Alpha in the process–and threatened to kill Jennifer to save his “pack.” Impatient, the Deucalion stepped forward and slit the Darach’s throat, effectively cutting off the storm. Stiles, having arrived at the cellar in time to help hold it up with a baseball bat, gave Scott a call for help. Then, in a decision they’ll probably come to regret, Derek and Scott let the Deucalion live and told him to get the hell out of town. As the midseason finale came to a close, Scott filled Deaton (and the audience) in on the current happenings in Beacon Hills. Derek and Cora left town, the Argents came up with a new family motto (“We protect those who cannot protect themselves”), Scott’s father stuck around but isn’t welcome, and Scott and Stiles feel the darkness surrounding their hearts every day. To lesson the weight, Scott simply looks at his friends: Lydia and Aiden, Danny and Ethan, Isaac and Allison, and, of course, Stiles. All’s well that ends well, right? WRONG. Peter, who WAS up to no good last episode when he encouraged Derek to sacrifice his Alpha status for Cora’s life, found Jennifer crawling to the Nemeton to be healed and killed her before she could touch the tree. Then, he shouted to the skies that he is, and has always been, the Alpha. And that’s it, see you in January! 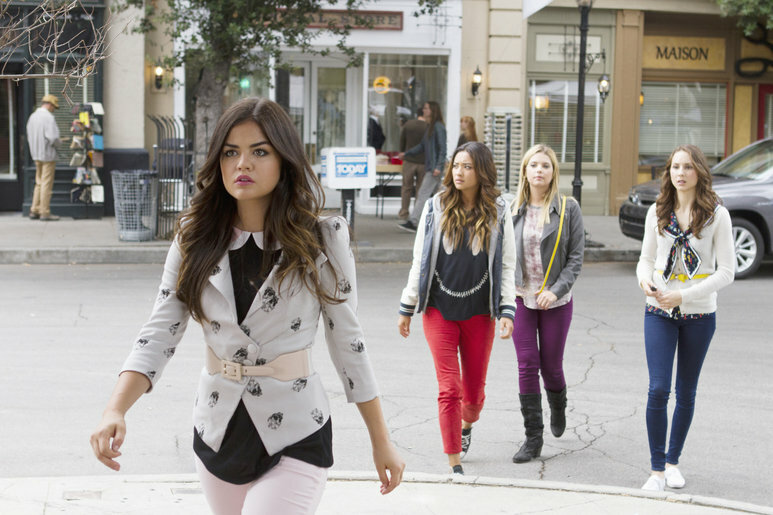 Bonus: The song playing toward the end of the episode, when Scott returned to school, was “Kids” by Mikky Ekko. With a vicious storm, a dying wolf, and one flighty Darach, “The Overlooked” managed to bring almost all of Teen Wolf‘s current heroes, anti-heroes, and villains under one roof for a nonstop thrill ride of corny one-liners (cough, “Let’s rumble,” cough), near deaths, kidnappings, and the occasional heart-to-unconscious-heart. Despite the high intensity level (thanks to the impending mid-season finale, which is only two episodes away), “The Overlooked” still took the time to fill in a few plot blanks and illuminate the cracks forming within the Alpha pack’s ranks as everyone converged on Beacon Hills’s storm-ridden hospital. After last week’s stunning Darach unveiling, Scott and Stiles wasted no time getting the truth to Derek. When Ms. Blake swung by Derek’s loft hoping to lie about her evil Druidic nature, she found the boys had beaten her there–they stepped out of the shadows and doused her with mistletoe, revealing her hideously-slashed face. Enraged, Derek grabbed his lover-turned-enemy and began to strangle her, but Scott stopped him; without Ms. Blake, Cora can’t be saved and Stiles’s father will never be found. The four drove to the hospital–which was being evacuated because of the thunderstorm–to find Cora, who hadn’t been evacuated yet and was still vomiting black blood laced with mistletoe. After running into his mother, Scott told her to leave immediately, and she didn’t argue after noticing his companions. Mama McCall told Scott to get Cora on the next arriving ambulance, but the group found Cora’s room empty. Turns out, the Alpha twins had already arrived at the hospital and were busy shoving Peter (who’d been visiting Cora) through doorways and stealing Cora. As Derek and Scott attacked, Ms. Blake tried to run (so much for her claims that she sincerely wanted to heal Derek’s sister) while Peter and Stiles helped Cora. The twins claimed they were only after the Darach, which proved true when the Deucalion and Kali showed up to join the hunt. Unfortunately, Mama McCall stumbled across the Deucalion’s spear/cane stuck in the wall and pulled it free–the Deucalion promptly retrieved it from her and took her hostage. While hiding from the twins, Scott and co. heard Mama McCall make an announcement via “Mr. 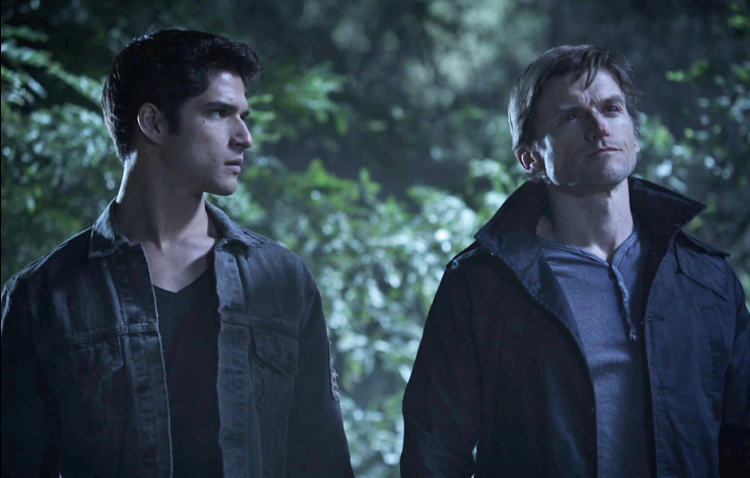 Deucalion” demanding the Darach be handed over. Ms. Blake found the group and told them she’d only help Cora and Stiles’s father in exchange for her safe escape from the hospital. Scott, knowing the Deucalion wouldn’t hurt his mother because he wants Scott on his team, agreed to distract the twins so the others could flee. Peter chose to fight with Scott, but only if he could find a suitable weapon. (His weapon of choice ended up being a shot of some drug that’d make him stronger.) The twins, who’d just been bickering over Ethan’s hesitation whilst fighting, attacked the pair, and Derek, Stiles, Cora, and Ms. Blake made a break for the ambulance. They encountered Kali waiting for them with a dead driver and the keys, so Derek and Ms. Blake ran as Stiles locked himself and Cora inside the ambulance. 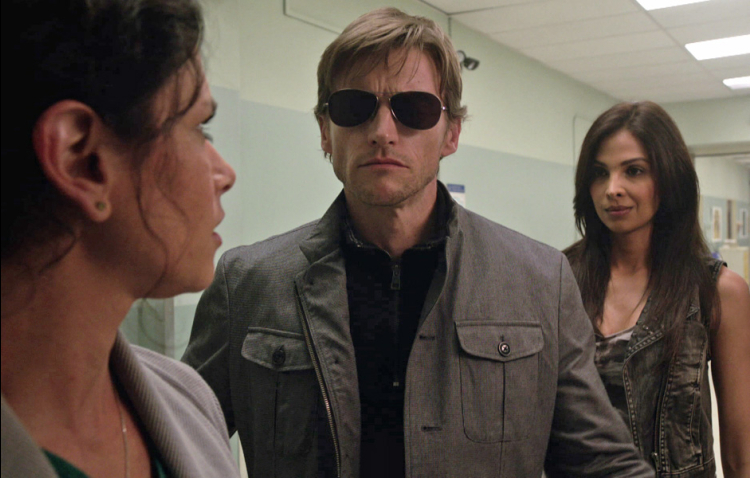 After shutting down the hospital’s power, the Deucalion freed Mama McCall (as a gesture of good faith) and trapped Derek and Ms. Blake inside an elevator. Back in the ambulance, Stiles realized Cora wasn’t breathing. Luckily, Stiles is skilled at CPR and saved her. After a humorous escape through the laundry chute, Scott and Peter headed for the ambulance, where they scared Stiles post-confession (he’d just told an unconscious Cora of his fears that she was right, and humans were only good for finding bodies–he feared he’d find his father’s body). Dropping an injured Peter off, Scott ran back to the hospital and attempted to single-handedly take on the twins. As they simultaneously choked him against a wall and insisted they weren’t trying to hurt him, Mama McCall attacked with a defibrillator and knocked the twins to the ground. Meanwhile, Ms. Blake decided being trapped in an elevator with Derek was a good time for some confessions. For starters, her real name is Julia, and she was Kali’s emissary. Against the Deucalion’s orders, Kali had spared Julia because she loved (!) her. (Kali has a heart after all!) Though Kali did claw Julia almost to death, she chose to leave her to die in peace rather than finish the job. Big mistake, because Julia crawled to the Sacred Druid Tree, where Derek’s sacrifice of the virgin (his girlfriend Paige, whom he killed on the tree’s roots) had woken the tree’s powers; in turn, the tree gave Julia the strength to remain alive until she was found. Then, Ms. Blake told Derek a story about mistletoe that involved feuding gods and death and mistletoe being overlooked as a weapon–her point being the Alpha’s overlooking their emissaries, AKA the basis behind her revenge-murder scheme. To punish the Alpha’s, Julia gained power from her sacrifices and planned to murder them all during the lunar eclipse, when, as Derek finally revealed, werewolves lose all of their power. Scott and his mother found the Argents and Isaac (they’d arrived to help after learning Scott and co. were trapped inside) roaming the hallways and began to formulate a plan. Allison, the increasingly-awesome BAMF, came up with a plan first. To attract the twins, Derek opened the elevator doors loud enough for them to hear; the twins took the bait, and Isaac, who’d been watching the hallway via his phone, drove for the ambulance to rescue Cora, Stiles, and Peter. As he was leaving the ambulance, Stiles noticed a sheet of paper requesting the signature of a parent or guardian and puzzled out who Ms. Blake was targeting. As soon as he conveyed this information to Scott, Scott took off to find his mother. Instead, he found an unconscious Derek lying face down in the elevator and the Deucalion waiting on the roof. The Deucalion offered Scott a deal: he’d help rescue Scott’s mother and Stiles’s father, but only if Scott joined the Alphas and helped take down the Darach. Despite Stiles protests that they’d find another way, Scott chose to go with the Deucalion. 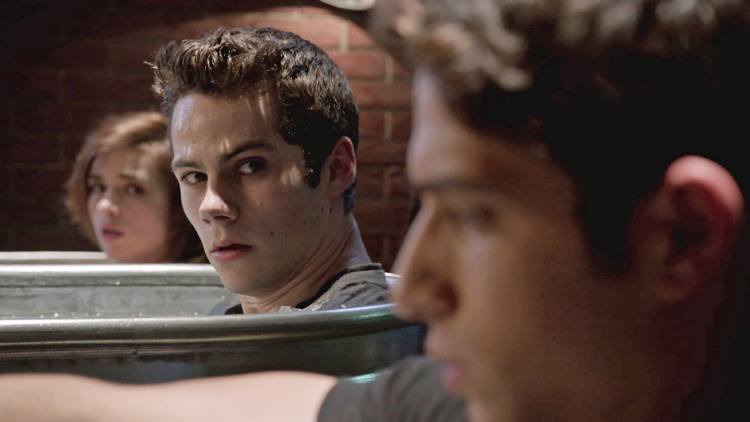 Lastly, Mama McCall woke up in the root cellar where Mr. Stilinski was also being held. Good to see they’re alive, for now. –With the twins fighting, Ennis long dead, and the Deucalion realizing Kali betrayed his orders before she even joined his pack, the Alpha pack’s really showing its fractured foundation. Adding Scott to the mix could only hurt them further, as he’ll likely be favored. Not to mention, he’s different–if he becomes an Alpha, he’ll have done it without murdering anyone, and he’s not joining the pack too willingly. –Mr. Argent seems to have done a 180 since season one; he stormed into the hospital with Allison and Isaac to save werewolves. Does this mean he’s firmly on the hero side now? It could be argued that he simply wanted a chance to kill the Darach, since he has been hunting her, but I think he would’ve gone in otherwise. Bonus: Here’s the song that played at the end of the episode, as Scott tried to save his mother. It’s “And The World Was Gone” by Snow Ghosts.